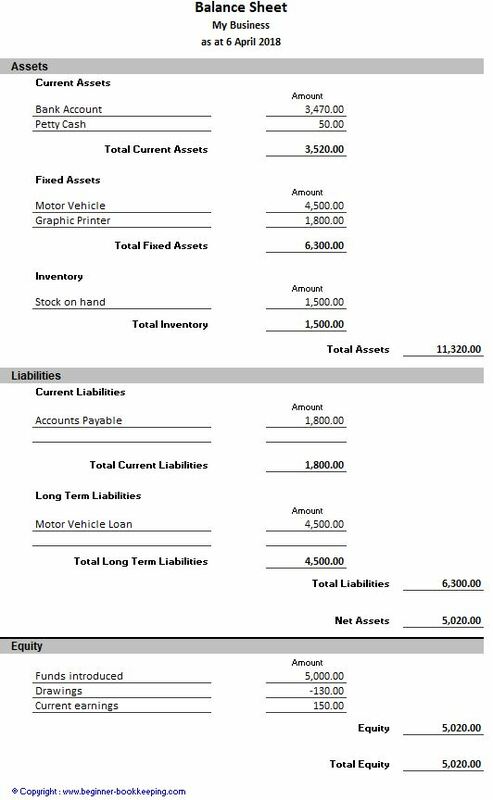 Below is a sample balance sheet, an important business report, that you can achieve in six easy steps. 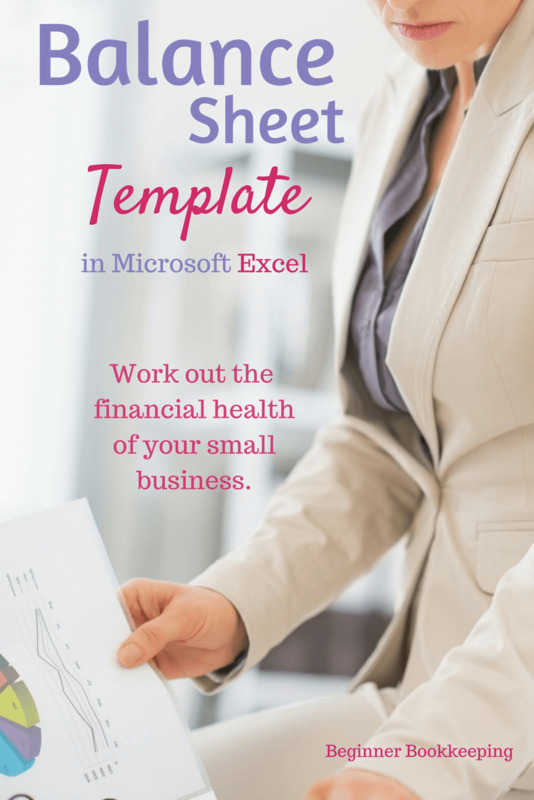 Work through these steps and you should be able to confidently pull together a basic sheet, and actually understand it! 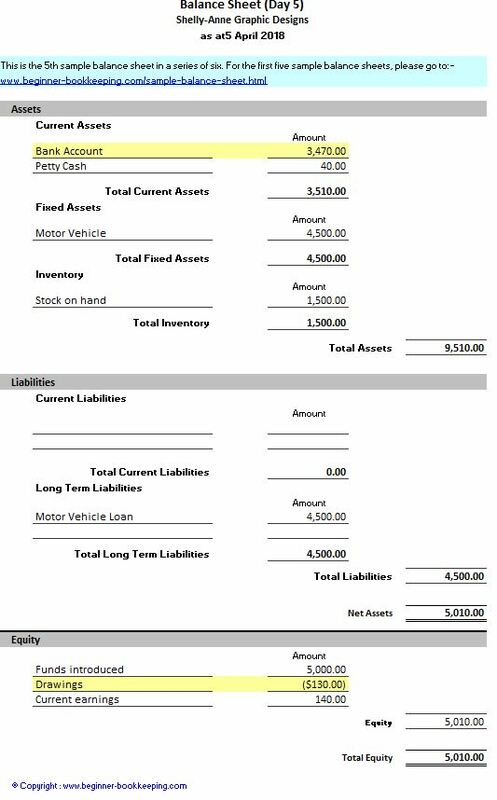 In each of the six steps you will find details of business transactions and their effect on the balance sheet. You will have access to a free sample for each step. Simply click on each image to enlarge. I recommend reading up on the accounting equation first because it plays an important role in producing these reports which are derived using the double-entry bookkeeping method. The net assets and total equity should always equal the same. Shelly-Anne started up a graphic design business which she registered as a company. 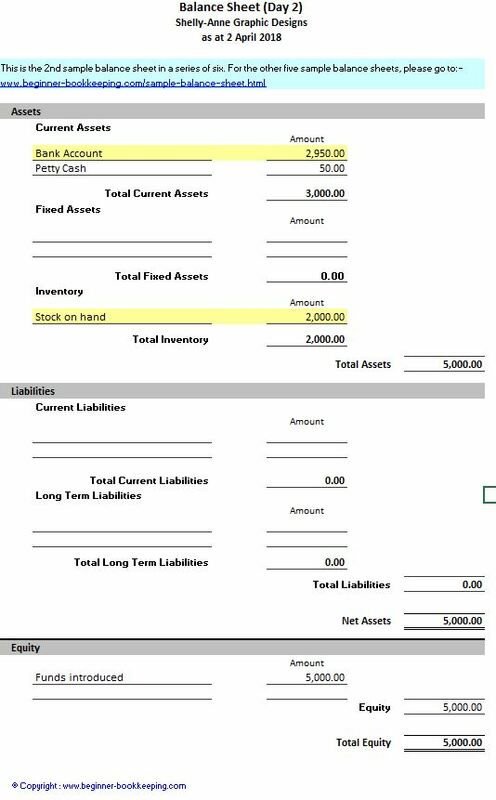 Each day, when she carried out a business transaction the balance sheet changed to reflect this transaction. This has been greatly simplified with just one or two transactions per day so you can easily see the effect they make. There are always two changes to maintain the double-entry method of bookkeeping. You may want to read just one 'Day' per day to help you digest and remember what you have read before moving on to the next 'Day'. Shelly-Anne introduced her own money of $5,000.00 into the business. $4,950 is the amount left in the bank account at the end of the day. $50 is the amount in the petty cash account at the end of the day. 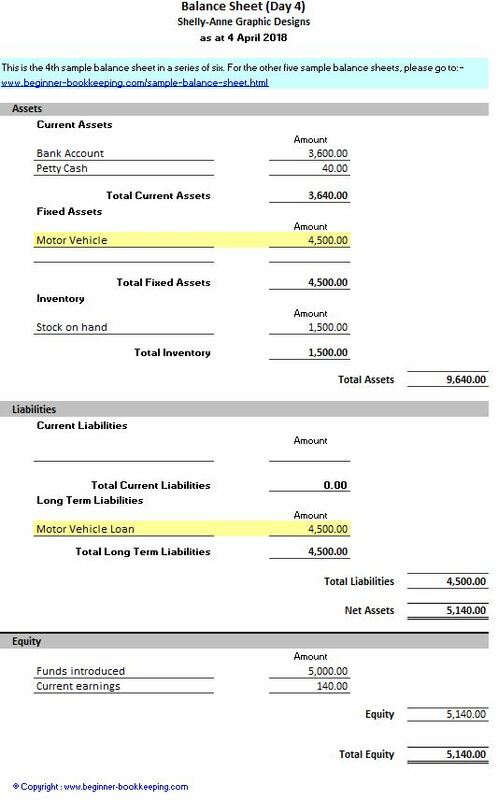 $5,000 is the amount in the Equity account at the end of the day. The next day, Shelly-Anne brought t-shirts and caps to sell. She paid the cost in full by bank transfer. The next day, Shelly-Anne sold some shirts and caps to her first customer who paid cash. Shelly-Anne deposited the cash that same day. $150 is the profit Shelly-Anne makes on the sale of her stock because she added a 30% markup to the stock before selling it. $150 is added to the current earnings. This is the net profit and is calculated using a simple income statement. 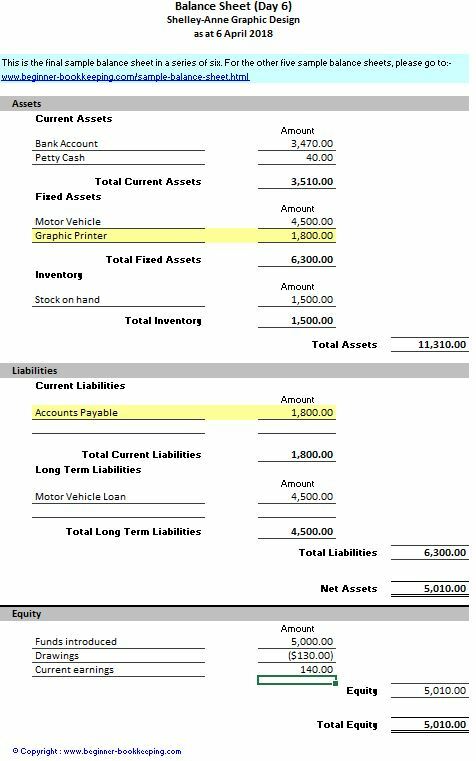 You may have come across balance sheets with 'Retained Earnings' listed above 'Current Earnings'. Retained earings are the accumulated net profits from previous years trading.Current earnings will only ever show the net profit from the current financial year. On the fourth day, Shelly-Anne brought a van for her business. She was given approval of a finance loan to pay for it, which she was contracted to pay off over 3 years. On the fifth day, Shelly-Anne had run out of personal funds and needed to buy some groceries so she used $130 of the business funds. 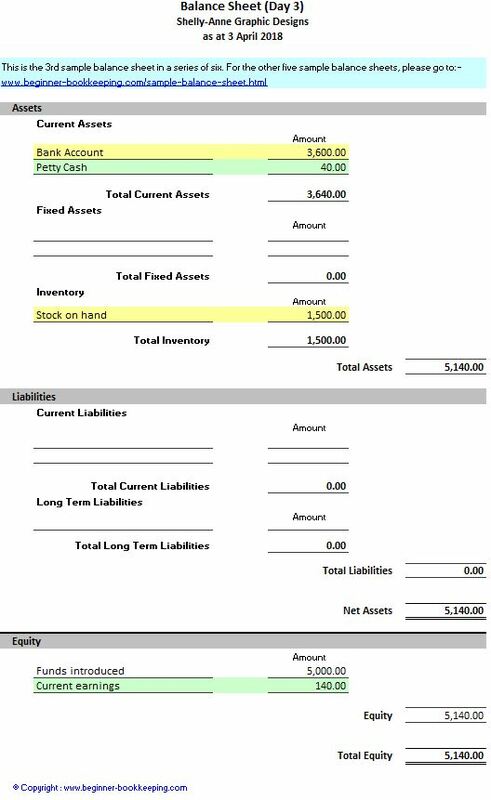 $130 is placed against the drawings account on the balance sheet which decreases the owner's equity. On the sixth day (the final day for this business model), Shelly-Anne brought a specialized graphic printer. She was able to open an account with the supplier, so she did not have to pay for it right away, but it did have to be paid for by the end of the following month. 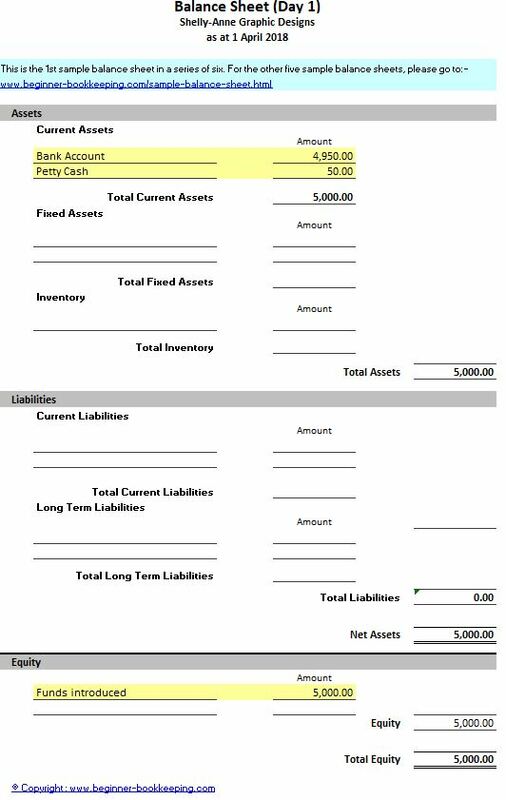 $1,800 is added to the creditors (accounts payable) account - this increases the liabilities of the business to $6,300. This is a current liability because it will be paid for within 12 months.